Two books, seemingly very different, come together at a deeper level with a consistent message important to us all. One author is older but fresh and vibrant; the other is young (32) but mature for his age. One sets forth a spirit of generosity in our giving to social justice. The other sets forth a radical spirit of sacrifice in our spreading the gospel of Jesus Christ. But each book preaches against a common enemy: selfish comfort. Generous Justice shows how we prioritize personal comforts and turn numb hearts away from the poor in our society. Radical shows how our devotion to the “American Dream” buffers us from the urgency of obediently carrying the Gospel message to people globally. Each book anchors its arguments deeply in a clear reading of the Bible. It’s our cultural pursuit of comfort that has blurred our vision of what is ultimately important in life. The books seem to come together from opposite directions. Generous Justice argues that we have drifted into a numb apathy toward the disadvantaged of our society, namely the widow, the orphan, the immigrants, the and the poor. Liberal theorists, he says,believe that the “root causes” of poverty are . . . racial prejudice, economic deprivation, joblessness, and other inequities.” Conservative theorists put the blame on the breakdown of the family, the loss of character qualities such as self-control and discipline, and other habits and practices of the poor themselves. But the Bible provides a balanced matrix of causes as well as solutions. Real success is found in radical sacrifice. Ultimate satisfaction is found not in making much of ourselves but in making much of God. The purpose of our lives transcends the country and culture in which we live. Meaning is found in community not individualism. Joy is found in generosity not in materialism. Truth is found in Christ not universalism. Jesus is a reward worth risking everything to know, experience, and enjoy. 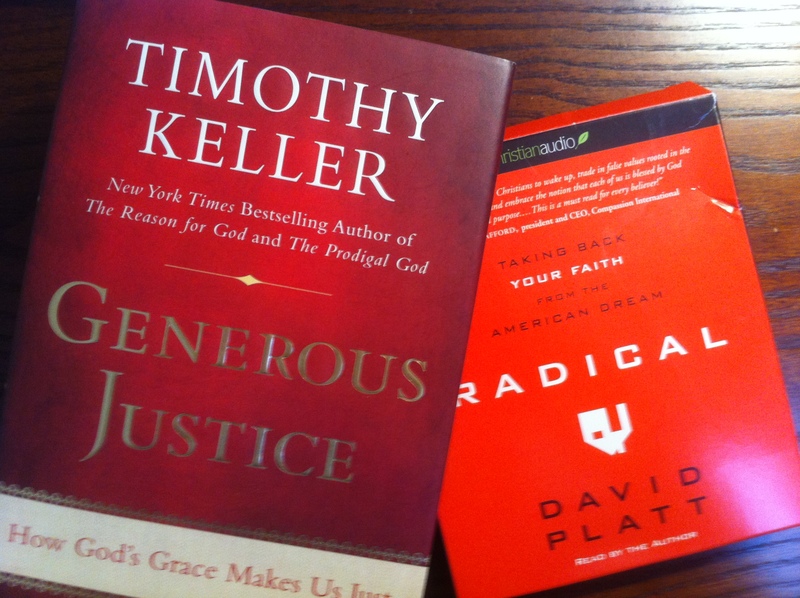 When Tim Keller came to Dallas last month, I asked him what he wanted people to get from his book, Generous Justice. The simplicity of his answer was as profound as his book. He wanted people to see that social justice is a biblical mandate. Neither the political right nor the left have it. It’s not a Democratic or Republican concept. You simply can’t have authentic Christianity without it! It emanates from the core of God’s character who provides our ultimate example of contributing to the advantage of the poor while disadvantaging the self. It connects the character of God to the Image of God in his creation . . . through us. Many philosophers and sociologists wrestle with getting a grip on what social justice is, and indeed it touches many issues of the human condition, but the ultimate reference point that should motivate us to do justice is the Bible. I think it’s appropriate that an older man would call something so radical (doing justice) as “generous.” It was the younger man who wrote how something so generous (the Gospel of Jesus Christ) as “radical.” The Mission Frontiers publications that usually features thatched-roof dwellings in unreached areas of the world devoted a recent issue to this megachurch in Birmingham, Alabama. So what? There’s a danger in assuming that the way we’ve always thought about things is the right way, or even the best way. These two books will challenge your assumptions and your thinking about how to live your life . . . if you let them. They have influenced my thinking. Disadvantaging ourselves for the advantage of the poor in our society must take precedence over the accumulation of stuff. Sacrificing luxuries so we can promote the spread of the Gospel must take precedence over comfortable Christianity. We don’t do a very good job of listening. I work real hard to listen to my clients as they express their personal issues. Often, I miss what they’re saying and need some help. More often, they miss what each other is saying and need a lot of help. So if we don’t listen well, we don’t understand what’s really going on with the other person. Or another . . . So we ought to be working hard to make sure we listen intently so our responses are to the point. Ken Boa writes a wonderfully clear article about what the Bible ways about the importance of listening. Just to illustrate the point more vividly and visually, take a look at Clement Valla’s artistic project. He asked 500 people to use an online drawing tool that lets users do just one thing – trace a line. Each new user only sees the latest line drawn, and can therefore only trace this latest imperfect copy. Watch the distortions that take place over the sequence of 500 attempts to trace a line! It’s amazing to me that we’re able to communicate much of anything, given our poor skills. In the meantime, let’s be patient with one another, not expecting to be heard precisely right the first time. We need to work on clarity. According to Tim Keller, and more importantly, according to the Bible, there are three levels of social justice. Relief – direct aid to meet immediate physical, material and economic needs. Development – training that is needed for an individual or community to move beyond dependency on relief into a condition of greater self-sufficiency. Reform – change in the conditions and social structures that aggravate or cause dependency. I’m most familiar with the “relief” level through the efforts of The Salvation Army (disaster relief) and Good Will. But the people that provide development are all too often hidden from view. They deserve to be showcased. They need to be easily accessible. Since Robert graduated with a Masters Degree in Biblical Counseling, his next step is to provide low cost (perhaps free) counseling. Later, he plans to offer career mentorship, community re-entry programming, and prison ministry. You are currently browsing the J. Lee Jagers, PhD, ThM, LPC blog archives for February, 2011.